Verizon confirmed our report from yesterday that the Samsung Galaxy Tab 7.7 LTE would be arriving officially on March 1 (this Thursday). If interested, you can pick one up for $499 on a new 2-year contract or buy it outright at $699. I don’t think I need to mention how out of their minds they are for overpricing yet another LTE tablet, so I’ll instead focus on the positives. This tablet is ultra-thin (thinnest in the world for LTE tabs), has a Super AMOLED Plus display, dual cameras, a 1.4GHz dual-core processor, and may just be the perfect size at 7.7 inches. It will run Honeycomb (Android 3.2) out of the box and there is no mention yet as to Verizon or Samsung’s plans to update it to Ice Cream Sandwich. We would hope that it is in the plans though. Be sure to check out our hands-on with the device from CES. BASKING RIDGE, NJ — Announced at this year’s Consumer Electronics Show (CES), the Samsung Galaxy Tab™ 7.7 will be available in Verizon Wireless Communications Stores and online atwww.verizonwireless.com starting March 1. 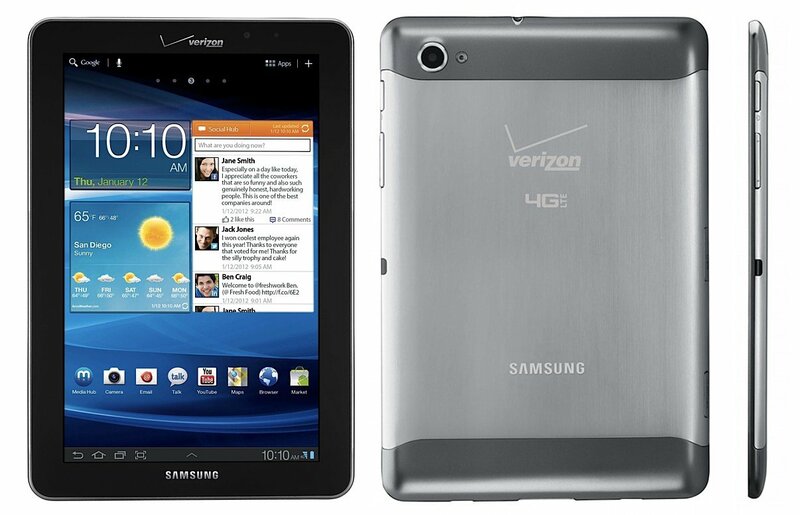 Movies, pictures and games come to life in high-definition with the Samsung Galaxy Tab 7.7’s Super AMOLED™ Plus touchscreen display. Customers can quickly access the Web, stream music and more at blazingly fast speeds using the Verizon Wireless 4G LTE network combined with a 1.4 GHz dual-core processor and HTML 5 Web browser. The Tab 7.7 is a multimedia expert allowing customers to use their tablet as the center of their home entertainment system. The Peel Smart Remote feature eliminates the need for multiple remote controls for televisions, audio players and other home entertainment systems. Customers can make their Tab 7.7 the master controller to find and watch their favorite TV shows, create a favorites list, set program reminders and more. Customers also have the ability to stream media to their compatible TV using the HDMI Multimedia Dock with a built-in HDMI port or the HDTV Adapter (sold separately). The Samsung Media Hub offers a large selection of media to rent or purchase and watch while traveling or plug into a TV to share at a party.